Erosion much more rapid than normal, natural, or geologic erosion, primarily as a result of the influence of human activities or, in some cases, of other animals or natural catastrophes that expose bare surfaces, e.g., fires. A temporary or permanent entry into a land parcel. 1. Sensitivity to or appreciation of the forest's beauty through recognition of its unique and varied components. 2. Beauty through an orderly appearance. Obstructions to pedestrian, horse, and/or vehicular traffic. They are intended to restrict such traffic to a specific location. A site preparation method in which special equipment is used to concentrate surface soil and forest litter into a ridge 6 to 10 inches high on which forest seedlings are to be planted. A practice, or combination of practices, that is determined to be an effective and practicable (including technological, economic, and institutional considerations) means of preventing or reducing the amount of pollution generated by nonpoint sources to a level compatible with water quality goals. The lowlands or flood plain adjacent to streams and rivers. Some type of heavy panel which can be used in multiple to construct a temporary crossing over streams, ditches or other small waterways during logging operations. Most bridgemats are constructed either of heavy wood timbers or fabricated steel panels. Some new panels are being tested that are built of engineered lumber and/or composite materals. Surface runoff diversions built into the bed of a forest road that consist of a long approach section, a low, out-sloped middle section, and a short terminal section with a reverse grade. A vegetation strip or management zone of varying size, shape, and character maintained along a stream, lake, road, recreation site, or different vegetative zone to mitigate the impacts of actions on adjacent lands, to enhance aesthetic values, or as a best management practice. Supervised burning under selected weather conditions to reduce litter, logging debris and unwanted vegetation to permit tree planting, natural seeding or to improve an existing stand for fire protection or wildlife habitat improvement. A technique of skidding logs to a landing by wire rope cable. Logs are lifted partially or totally free of the ground during skidding. A natural water-bearing trough cut vertically into low areas of the land surface by erosive action of concentrated flowing water; also a ditch or canal excavated for the flow of water. A small dam constructed in a gully or other small watercourse to decrease the stream flow velocity, minimize channel scour and promote deposition of sediment. It creates a miniature sediment basin. The use of herbicides to reduce competition from weeds, grasses and trees that compete with newly planted seedlings. Substances applied to forestlands or timber to accomplish specific management purposes and includes pesticides, insecticides, rodenticides, plant-growth regulators, fungicides, fertilizers, desiccants, fire retardants, repellents, oil, dust-control agents (other than water), salt, and other materials, natural or foreign, added to the forest environment. A regeneration method of timber harvesting in which all suitable trees within a designated area are removed, leaving ground material in place, along with stumps and leftover woody debris. This method typically is needed to successfully re-generate most pine species, and some hardwood species of trees. Note that clearcutting should not be confused with land clearing operations, in which all material is scraped off the ground and stumps are removed to allow for a conversion of use to non-forestry purposes. A general term signifying the introduction into water of micro-organisms, chemical, organic, inorganic wastes or sewage, which renders the water unfit for its intended use. An imaginary line on the surface of the earth connecting points of the same elevation. A line drawn on a map representing points of the same elevation. A metal, plastic, or concrete pipe through which surface water can flow under roads or trails. Portion of land surface or area from which earth has been removed or will be removed by excavation; the depth below original ground surface to excavated surface. Process of earth moving by excavating part of an area and using the excavated material for adjacent fill areas. A practice in which trees shading an access road are removed to increase the sunlight on the roadway and along its periphery. This relatively inexpensive practice maximizes forest edge and cover for wildlife and helps maintains passable roads year-round by speeding up the drying process. An area designated on a logging job for the temporary storage, collection, handling, sorting and/or loading of trees or logs. Small pieces of dead and decomposing plants and animals. Detached and broken-down organic fragments of structure. Small organic particles such as leaves and twigs. The breaking down of soil aggregate into individual particles, resulting in single-grain structure. Generally speaking, the more easily dispersed the soil, the more erodible it is. A drainage depression or ditch built across a slope to intercept surface or subsurface runoff or to divert surface water from that slope. Partially decomposed organic material of the forest floor beneath the litter of freshly fallen twigs, needles, and leaves. A stream that flows only during and for short periods following precipitation and flows in low areas that may or may not have a well-defined channel. Ephemeral stream bottoms are usually above the water table, and covered with litter similar to the forest floor. The wearing away of the land surface by rain, running water, wind, ice, gravity, or other natural or anthropogenic agents. Also see "Accelerated Erosion". Refers to the capacity of falling or flowing water to erode land surfaces. A tractor specially built for harvesting trees. Feller bunchers use either a large set of cutting shears, a heavy-duty chainsaw bar, or a large circular sawhead to cut the trees. Different feller buncher types include: Rubber-tired models, with either 4-wheels or 3-wheels; Track-mounted models, on either a rotating platform or fixed chassis. Any substance or combination of substances used principally as a source of plant food or soil amendment. The surface area formed where earth is deposited to build a road or trail. Belts of vegetation-grass, shrubs, and/or trees-maintained along streams or on the contours insloping fields to trap sediment and agricultural chemicals before they enter waterways. A strip of land or trail/pathway that is maintained as an open corridor that can help slow down or stop wildfires. Trails, roads, rivers, canals, or utility rights-of-way may be considered as firebreaks in times of an emergency if necessary. Any cleared trail or pathway that is created to surround an area that is burning or is scheduled to be burned, in order to prevent the fire from spreading outside the intended or desired area. A fireline should expose the bare mineral soil so there is no debris that can catch on fire and allow the fire to spread. A fireline may be installed using a tractor blade, a specially-designed fire-plow, or by using hand tools such as shovels and rakes. Firelines are used to control wildfires and to contain prescribed burns. Colored plastic ribbon attached to trees or stakes to make boundaries, stakes, and other markers visible. A system of removable boards or panels that can be installed on culvert outlets or in drainage ditches to regulate the amount and/or flow of water in ditches and the nearby ground water levels. Surface water movement due to the influence of gravity or of tides. A submerged stream crossing which will bear intended traffic. Chemical substances or formulations that perform important functions in forest management. They include fertilizers, herbicides, repellents and other chemicals. The exclusion of a forestry site from permitting requirements of the Sedimentation Protection and Control Act is in effect as long as the site is in compliance with the nine Forest Practice Guidelines Related to Water Quality. A layer of accumulated dead organic material consisting of partially or fully decomposed leaves, needles, twigs, etc., on the surface of a forest soil. Any activity conducted on or directly pertaining to forestland and relating to growing, harvesting, or processing timber, including, but not limited to: Road and trail construction Harvesting, final and intermediate Precommercial thinning; Reforestation; Fertilizationl Prevention and suppression of diseases and insects; Salvage of trees; Control of vegetation; Planting. "Forest Practice" shall not include preparatory work such as tree marking, surveying, and road flagging; or removal or harvest of incidental vegetation from forestlands, such as berries, ferns, greenery, mistletoe, herbs, mushrooms, and other products which cannot normally be expected to result in damage to forest soils, timber, or public resources. All land which is capable of supporting a merchantable stand of timber and is not being actively used for a use which is incompatible with timber growing. Any person in actual control of forestland, whether such control is based either on legal or equitable title, or on any other interest entitling the holder to sell or otherwise dispose of any or all of the timber on such land in any manner; PROVIDED, that any lessee or other person in possession of forestland without legal or equitable title to such land shall be excluded from the definition of "forestland owner" unless such lessee or other person has the right to sell or otherwise dispose of any or all of the timber located on such forestland. A self-propelled machine, usually self-loading, that transports trees or logs by carrying them completely off the ground. North Carolina administrative code that was adopted in 1989 (becoming effective January 1, 1990) defining the need to protect water quality during forestry related operations. Complying with the FPG's will allow a forestry operation to remain exempt from permitting requirements under the state's SPCA. Correctly implementing appropriate BMPs during a forestry site-disturbing operation typically will allow that forestry operation to comply with the FPG's. A form of site preparation work done with a V-Blade or fire plow which pushes aside debris and vegetation and/or cuts a trench into the mineral soil to enhance tree planting. The slope or a road or trail; the change in elevation per unit of horizontal distance traveled, usually expressed as a percent. Hinged jaws or arms capable of being opened and closed and used to grip logs or trees during skidding or loading. A skidder fitted with a grapple for skidding logs. See "Skidder"
Any vegetative growth of other natural or manmade material that renders the soil surface stable against rainfall impact or accelerated erosion. The subsurface water in both phreatic (saturated) and vadose (unsaturated) zone water at a pressure equal to or greater than atmospheric that is free to move under the influence of gravity. Groundwater is recharged by infiltration and enters streams through seepage and springs. The removal of soil by water running in narrow channels, which may be eroded to depths ranging from 1 to 20 feet to as much as 75 to 100 feet. 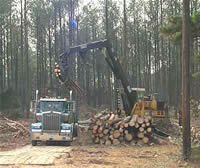 The felling, loading, and transportation of forest products, roundwood or logs. Any substance, or mixture of substances, intended to prevent the growth of or to destroy terrestrial or aquatic weeds. Weeds are any woody or non-woody undesirable vegetation. The ease with which the active ingredients can move away from the area of application. This movement can be by drift, evaporation, rain, runoff, or through the soil. Insecticide: Any substance or mixture of substances intended to prevent, destroy, repel, or control any insect or other arthropod. Rate at which water moves into the soil surface. A watercourse that flows in a well-defined channel during wet seasons of the year but not the entire year. The water table is above the stream bottom during parts of the year. A type of specialized bulldozer blade used in forestry site-prep applications to cut through leftover stumps and pile large debris to help clear land for tree regeneration. A piece of heavy equipment used to load trees and/or logs onto a truck or other means of transport. Smaller loaders can be mounted directly onto log trucks. Larger loaders are mounted on trailers, some of which may be self-propelled for moving around the loading yard area. Tree tops and branches that remain after logging. Also known as "Slash"
The surface layer of the forest floor that is not in an advanced stage of decomposition, usually consisting of freshly fallen leaves, needles, twigs, stems, bark, and fruits. Unwanted, unutilized, and generally unmarketable accumulation of woody material in the forest such as large limbs, tops, cull logs, and stumps that remain as forest residue after timber harvesting. A type of trailer used to haul heavy, off road equipment or machinery. Road that supports a high level of traffic, usually well built and well designed. A word used to describe general food sources for wildlife. Acorns, hickory nuts, walnuts and pecans are some examples of "hard" mast. Blackberries, grapes, persimmons and cherries are some examples of "soft" mast. see either "Bridgemat" or "Road mats"
Any place where forest products are stored, altered, or processed. A soil or that part of a soil consisting predominately of and having its properties determined predominately by mineral matter, usually containing less than 20% organic matter. A natural or artificial layer of plant residue or other materials covering the land surface which conserves moisture, holds soil in place, aids in establishing plant cover, and minimizes temperature fluctuations. Renewal of the forest achieved either by natural seeding or from the vegetative reproduction of the plants on the site. Forestland owned by a private individual, group, or corporation not involved in wood processing. Pollution that enters a waterbody from a diffuse or widespread origin in the watershed. Examples include stormwater runoff or soil erosion. Mineral elements in the forest ecosystem such as nitrogen, phosphorus, or potassium, that are naturally present or may be added to the forest environment by forest practices such as fertilizer or fire retardant applications. Substances necessary for the growth and reproduction of organisms. In water, those substances that promote growth of algae and bacterial; chiefly nitrates and phosphates. Particles of vegetation or other biologic material. A soil or that part of a soil containing greater than 20 or 30 percent organic matter (depending on clay content). The removal of a portion of the trees in a stand of timber so as to leave an even-aged or uneven-aged stand of well-distributed residual, healthy trees that will reasonably utilize the productivity of the soil. Partial cutting does not include seed trees or shelterwood or other types of regeneration cutting. Rate at which water moves through the soil. A watercourse that flows in a well-defined channel throughout most of the year under normal climatic conditions. Includes small creeks up to large rivers. The quality of a soil horizon that enables water or air to move through it. The permeability of a whole soil may be limited by the presence of one nearly impermeable horizon even though the others are permeable. The relative ability of a pesticide to remain active over a period of time. A chemical used to kill pests. The term includes insecticides, fungicides, herbicides, and rodenticides. A type of pollution that comes from a specific, known location or source. Examples include wastewater treatment plants and industrial discharge outlets. The presence in a body of water (or soil or air) of substances of such character and in such quantities that the natural quality of productivity of the environment is impaired or rendered harmful to health and life or offensive to the senses. Forest preharvest planning (FPP) is a process that identifies and summarizes pertinent information about a tract of land from which timber will soon be harvested. This information may include applicable environmental regulations; specific attributes related to the site such as topography, soils, and water resources; and details of the timber such as size, species, or accessibility. The primary purpose of preharvest planning is to design a harvest operation that meets landowner objectives while addressing the environmental and operational characteristics of a proposed forest harvest site. A road designed and maintained for a high level of use, and generally part of a larger, permanent road system on a tract of land. Usually these roads have some type of reinforcing material on the travel surfaces, such as gravel (or clay, for sandy roads) and can sustain usage even during poor weather conditions. These roads should have appropriate ditches and other water-control structures integrated into their design, layout and maintenance. The process of forest replacement through natural sprouting of seedlings. Live trees left standing after the completion of harvesting. The removal of soil by numerous small channels only several inches deep. Rills occur mainly on recently cultivated soils or recent cuts and fills. Of, on, or pertaining to the banks of a stream, river, pond, or lake. An area adjoining a body of water, normally having soils and vegetation characteristic of floodplains or areas transitional to upland zones. The areas help protect the water by removing or buffering the effects of excessive nutrients, sediments, organic matter, pesticides, or pollutants. Rock or other large aggregate that is placed to protect streambanks, bridge abutments, fords, or other erodible sites from runoff or wave action. Large wooden pallets which are laid down to create a temporary roadway for log trucks to gain access into or out of the woods; typically used in wet or soft ground conditions on flat terrain. Road mats are also used on decks to set up a safe, stable loading area for trucks. A shallow depression built across a road or trail designed to remove storm water from the road or trail. Also see "Broad-based dip". In forest areas, that portion of precipitation that flows from a drainage area on the land surface or in open channels. Depressions in roads or trails made by repeated passage of wheeled vehicles. A form of site preparation work done with a plow or blade which removes unwanted vegetation by cutting and peeling back the upper layer of the mineral soil and forest floor. To wash away or remove soil from stream banks by a swift current of water. An unimproved road, usually with little or no surface reinforcement. Often these roads are bare dirt or naturally grassed over, and typically can only be used during dry conditions. Even though these roads may be used less frequently, they should still have appropriate water-control structures integrated into their design, layout and maintenance. 1. Solid material, both mineral and organic, that is in suspension and being transported from its site of origin by the forces of air, water, gravity, or ice. 2. Material thus carried that has come to rest on the earth's surface either above or below sea level. A small, excavated area in the earth used for temporarily holding sediment-laden water. The basin can stop flowing water to allow for sediment to settle out of the water. The remaining water is then naturally absorbed into the ground. The deposition of eroded soil material (sediment) into an ephemeral, intermittent or perennial stream, lake, or other water body. The process of sediment deposition usually resulting from erosion. The soil prepared by natural or artificial means to promote the germination of seed and the growth of seedlings. Removal of the mature timber, usually the oldest or largest trees, either as single scattered individuals or in small groups, at relatively short intervals repeated indefinitely in order to encourage continuous reproduction and uneven-aged stands. The movement of a thin, fairly homogenous layer of soil material by surface runoff water. Sheet erosion may be imperceptible, particularly when caused by wind, or else evidenced by numerous fine rills. Term used to describe the movement of water laterally across the surface of the ground, rather than flowing in defined channels or depressions. A logging system in which specialized equipment and methods are used to harvest bottomlands and wet areas of timber growth. Some trees, after being cut, are laid down on the ground to form a "floating" mat of logs that is then used by traditional skidders to drag newly-cut trees to the loading deck for processing and shipment. Once the mat logs are no longer needed, they are lifted off the ground and processed for shipment. This method of logging substantially improves the number of working days available for harvesting timber in wet areas, and provides greater protection from rutting and other soil damage that may occur on wet sites when they are harvested. Man-made fabrics that are strung up to block movement of soil or debris from getting into water. Typically they are installed alongside waterbodies, but may also be used effectively anywhere there is a risk of erosion. Silt fences are temporary structures that can easily be knocked down or washed away by large surges of water or material that result from heavy downpours. Therefore they should be used as one tool available to prevent erosion, and not considered as the only solution. They may be removed once a site is permanently stabilized and the threat of accelerated erosion no longer exists. 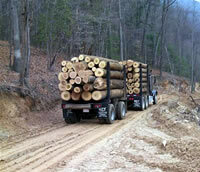 All forest management activities, including logging, log transport, and forest roads (EPA interpretation). The art, science, and practice of establishing, tending, and reproducing forest stands of desired characteristics. Any scheduled operation that is used to prepare an area for the re-generation of trees. These operations can be used individually or together, as needed, to prepare a site for tree regeneration. Examples include piling unusable woody debris or slash, (see "KG blade"); burning excess leftover branches and limbs (see "Burning"); disking the ground; bedding or furrowing; and applying forest chemicals (see "Chemical Site Prep"). Temporary, non-structural pathways over forest soil where felled trees or logs are dragged to a landing. A tractor or piece of equipment specially built for pulling trees that have been cut down. The trees are carried either in a grapple attached to the back of the tractor, or are dragged by a cable and winch attached to the rear of the tractor. Different skidder types include rubber-tired models, with either single tires or dual-tires; track-mounted models; and tandem axle models. 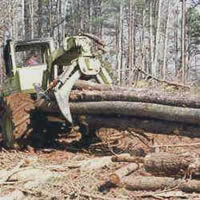 Also see "Forwarder"
Transporting logs or felled trees over the land surface by dragging them. The moving of logs or felled trees from the stump to the log deck. The rounded side of a log removed in the first cut of the breaking-down saw. The residue, e.g., treetops and branches, left on the ground after logging or accumulating as a result of storm, fire, girdling, or delimbing. Degree of deviation of a surface from the horizontal, measured as a numerical ratio, percent, or in degrees. Expressed as a ratio, the first number is the horizontal distance (run) and the second is the vertical distance (rise), as 2:1. A 2.1 slope is a 50 percent slope. Expressed in degrees, the slope is the angle from the horizontal plane, with a 90-degree slope being vertical (maximum) and 45 degree being a 1:1 slope. A dead, standing tree. Snags typically are good habitat for a variety of birds and small animals, and should be left in place if they do not pose a safety hazard of falling down or burning. During burning activities, snags may smolder for a long time after the rest of the fire is out. The unconsolidated mineral and organic material on the immediate surface of the earth that serves as a natural medium for the growth of land plants. Compression of the soil resulting in reduced soil pore space (the spaces between soil particles), decreased movement of water and air into and within the soil, decreased soil water storage, and increased surface runoff and erosion. The use of heavy machinery during forest operations contributes to soil compaction. Protecting and using the soil within the limits of its physical characteristics. The capacity of a soil in its normal environment for producing a specified plant or sequence of plants under a specified system of management. The relative proportion of the various size groups of individual soil particles. North Carolina law originally passed in 1973 which limits the amount of sedimentation that can occur during any site disturbing activities. Forestry and agricultural activities were originally exempted from compliance with the law. The forestry exemption was limited in 1989 with the amendment to the SPCA that created the FPG's and the requirement that forestry operations comply with the FPG's or be subject to the full provisions of the SPCA. 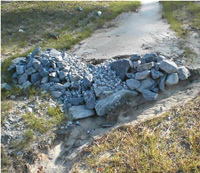 Excess material removed as overburden (cut) or generated during road or landing construction which is not used within limits of construction as fill. A term used to classify streams according to stream size, flow and channel structure. There are different types of stream order methods. One of the more widely used methods is provided here as an example (Strahler 1952): A 1st-order stream is the first channeled stream to occur in a watershed, and is fed by ephemeral streams. Generally, these are the smallest perennial streams within a watershed. A 2nd-order stream results when two 1st-order streams combine; A 3rd-order stream results when two 2nd-order streams combine; A 4th-order stream results when two 3rd order streams combine; Generally, streams are classified up to 4th-order. Anything larger than that is usually referred to as a "river." A designated area that consists of the stream itself and an adjacent area of varying width where management practices that might affect water quality, fish, or other aquatic resources are modified. The SMZ is an area of closely managed activity, not an area of exclusion. The scouring of material and cutting of channel banks by running water. The usual boundaries, not the flood boundaries, of a stream channel. Right and left banks are named facing downstream. The scouring of material and cutting of channel beds by running water. A 180-degree direction change in a trail or road used to climb steep slopes. A series of individual, small-scale sediment catch basins built on a retired skid-trail or road. 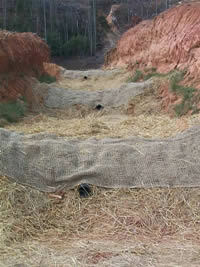 Tank-traps help slow the flow of water and prevent accelerated erosion. The tank traps collect water temporarily until sediment can settle out of the water. A temperature rise in a body of water sufficient to be harmful to aquatic life in the water. A tree removal practice that reduces tree density and competition between trees in a stand. Thinning concentrates growth on fewer, high-quality trees, provides periodic income, and generally enhances tree vigor. Heavy thinning can benefit wildlife through the increased growth of ground vegetation. The sum of: individual wasteload allocations for point sources + load allocations for non-point-sources + natural background occurrances + a margin of safety. TMDL's can be expressed in terms of mass per time, toxicity, or other appropriate measures that relate to a state's water quality standard. [ref: Protocol for Developing Sediment TMDLs, First Edition, US-EPA Office of Water EPA-841-B-99-004 October 1999]. The characteristic of being poisonous or harmful to plant or animal life; the relative degree of severity of this characteristic. A smaller type of log truck in which the logs are carried on a fixed-chassis rack attached directly to the truck frame. Some trucks may also pull a short trailer used for carrying logs (see "Pup trailer"). The cloudy condition caused by suspended solids, dissolved solids, natural or human-developed chemicals, algae, etc., in a liquid. 1. A widened space in a road to allow vehicles to pass one another. 2. A drainage ditch that drains water away from the road surface out into a vegetated area which allows the water to slow down and soak up into the soil. Also called "wing ditch". Branch of forestry concerned with the operation of harvesting and marketing the forest crop. Solid particulate matter, both mineral and organic, which can be seen with the unaided eye that has been or is being transported by water, air, gravity, or ice from its site of origin. This does not normally include colloidal sized particles. Materials and substances usually discarded as worthless to the user. A mound of soil built across a light-duty road, skid trail or trail, or fireline for the purpose of diverting surface water onto porous forest soil. Any river, creek, slough, canal, lake, reservoir, pond, sinkhole, or other natural or artificial watercourse that flows within a defined channel or is contained within a discernable shoreline. The addition of harmful or objectionable material to water in concentrations or sufficient quantities to adversely affect its usefulness or quality. An area on the land surface within which all runoff collects in a single stream or drainage system and exits through a single mouth or outlet. Actions taken to contain and suppress uncontrolled fires. Uncontrolled fires occurring in forestland, brushland, and grassland. Brushwood, slash, etc., concentrated (usually by machine) along a line, to clear the intervening ground for regeneration. Days exclusive of Saturday and Sunday during which weather conditions or soil conditions permit land-disturbing activity to be undertaken. 1. A cleared area where logs and/or trees are stored for processing or handling. 2. To transport logs and/or trees from the woods to a loading deck. This term is used for cable-logging or helicopter-logging systems. A system of power-operated winches and a tower used to haul logs from a stump to a landing.